Received September 28, 2017; Revised December 29, 2017; Accepted January 11, 2018. †Statistics by repeated-measures Chi-square test. †Statistics by repeated-measures analyses of variance (ANOVA). Yannuzzi LA, Sorenson J, Spaide RF, and Lipson B. Idiopathic polypoidal choroidal vasculopathy (IPCV). 1990. Retina 2012;32:1-8. Spaide RF, Yannuzzi LA, and Slakter JS et al. Indocyanine green videoangiography of idiopathic polypoidal choroidal vasculopathy. Retina 1995;15:100-10. Sho K, Takahashi K, and Yamada H et al. Polypoidal choroidal vasculopathy: incidence, demographic features, and clinical characteristics. Arch Ophthalmol 2003;121:1392-6. Song SJ, Youm DJ, Chang Y, and Yu HG. Age-related macular degeneration in a screened South Korean population: prevalence, risk factors, and subtypes. Ophthalmic Epidemiol 2009;16:304-10. Cheung CM, Yang E, and Lee WK et al. The natural history of polypoidal choroidal vasculopathy: a multi-center series of untreated Asian patients. Graefes Arch Clin Exp Ophthalmol 2015;53:2075-85. Laude A, Cackett PD, and Vithana EN et al. Polypoidal choroidal vasculopathy and neovascular age-related macular degeneration: same or different disease?. Prog Retin Eye Res 2010;29:19-29. Uyama M, Wada M, and Nagai Y et al. Polypoidal choroidal vasculopathy: natural history. Am J Ophthalmol 2002;133:639-48. Spaide RF, Donsoff I, and Lam DL et al. Treatment of polypoidal choroidal vasculopathy with photodynamic therapy. 2002. Retina 2012;32:529-35. Lai TY, Chan WM, and Liu DT et al. Intravitreal bevacizumab (Avastin) with or without photodynamic therapy for the treatment of polypoidal choroidal vasculopathy. Br J Ophthalmol 2008;92:661-6. Lai TY, Lee GK, Luk FO, and Lam DS. Intravitreal ranibizumab with or without photodynamic therapy for the treatment of symptomatic polypoidal choroidal vasculopathy. Retina 2011;31:1581-8. Koh A, Lee WK, and Chen LJ et al. EVEREST study: efficacy and safety of verteporfin photodynamic therapy in combination with ranibizumab or alone versus ranibizumab monotherapy in patients with symptomatic macular polypoidal choroidal vasculopathy. Retina 2012;32:1453-64. Kokame GT, Yeung L, and Teramoto K et al. Polypoidal choroidal vasculopathy exudation and hemorrhage: results of monthly ranibizumab therapy at one year. Ophthalmologica 2014;231:94-102. Cho HJ, Kim JW, and Lee DW et al. Intravitreal bevacizumab and ranibizumab injections for patients with polypoidal choroidal vasculopathy. Eye (Lond) 2012;26:426-33. Stewart MW. Aflibercept (VEGF Trap-eye): the newest anti-VEGF drug. Br J Ophthalmol 2012;96:1157-8. Hosokawa M, Shiraga F, and Yamashita A et al. Six-month results of intravitreal aflibercept injections for patients with polypoidal choroidal vasculopathy. Br J Ophthalmol 2015;99:1087-91. Kokame GT, Lai JC, and Wee R et al. Prospective clinical trial of intravitreal aflibercept treatment for polypoidal choroidal vasculopathy with hemorrhage or exudation (EPIC study):6 month results. BMC Ophthalmol 2016;16:127. Cho HJ, Kim KM, and Kim HS et al. Intravitreal aflibercept and ranibizumab injections for polypoidal choroidal vasculopathy. Am J Ophthalmol 2016;165:1-6. Heier JS, Brown DM, and Chong V et al. Intravitreal aflibercept (VEGF trap-eye) in wet age-related macular degeneration. Ophthalmology 2012;119:2537-48. Oishi A, Kojima H, and Mandai M et al. 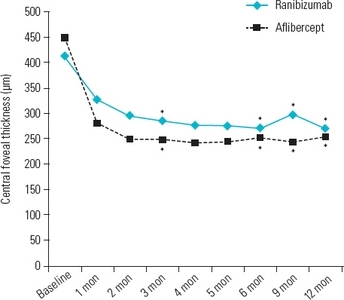 Comparison of the effect of ranibizumab and verteporfin for polypoidal choroidal vasculopathy:12-month LAPTOP study results. Am J Ophthalmol 2013;156:644-51. Kokame GT, Yeung L, and Lai JC. Continuous anti-VEGF treatment with ranibizumab for polypoidal choroidal vasculopathy:6-month results. Br J Ophthalmol 2010;94:297-301. Cho HJ, Baek JS, and Lee DW et al. 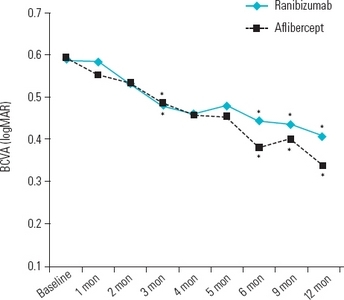 Short-term effectiveness of intravitreal bevacizumab vs. ranibizumab injections for patients with polypoidal choroidal vasculopathy. Korean J Ophthalmol 2012;26:157-62.